I know, I know. This petunia doesn’t look black at all in the photo. But I promise–when you see it in person, it looks like black velvet. You know what they say about a little black dress. Every woman needs one in her closet. But black flowers in your garden? Aren’t black blooms usually dead blooms? Well, no. I recently found a basket of gorgeous, near-black petunias at our local Home Depot, and they were so velvety and unusual, I just had to bring them home. But they aren’t completely black. 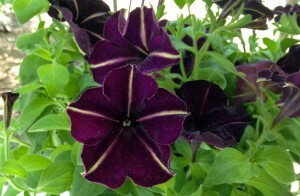 It’s hard to find truly black plants, and many are just very deep, dark shades of purple, purple-red, or blue. I’m telling you, so when you look at the pictures of my petunias, you won’t wonder what I’m talking about. That’s because my “black” petunias, when photographed in the sunlight, look purple. But when the light is right, they’re dusky and mysterious and beautifully, velvet-black. Each bloom has a pale yellow star in its throat. I don’t know the variety name, or I’d share it. 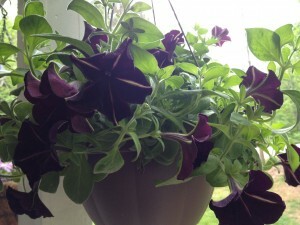 It’s possible that mine are ‘Pinstripe’ petunias; click here to see for yourself. I don’t think I have ‘Phantom,’ which is sold by other seed sellers and garden centers, because the yellow markings look too wide. But I bet if you look around, you can find something similar. If a dip into the world of inky plants makes you yearn for more, check out a book called Black Plants: 75 Striking Choices for the Garden, by Paul Bonine (Timber Press). The author covers black pansies, lilies, agapanthus, hollyhocks (like the ‘Black Watchman’ heirloom hollyhocks in my gardening book), and more, all of which might persuade you that black is the new green. Update: Thanks to Gary, at PlantCareToday.com, who wrote to tell me that King George III sent Napoleon Bonaparte’s brother, Joseph, to explore Argentina. While he was there, he collected samples that were used later to confirm that petunias and tobacco are related. 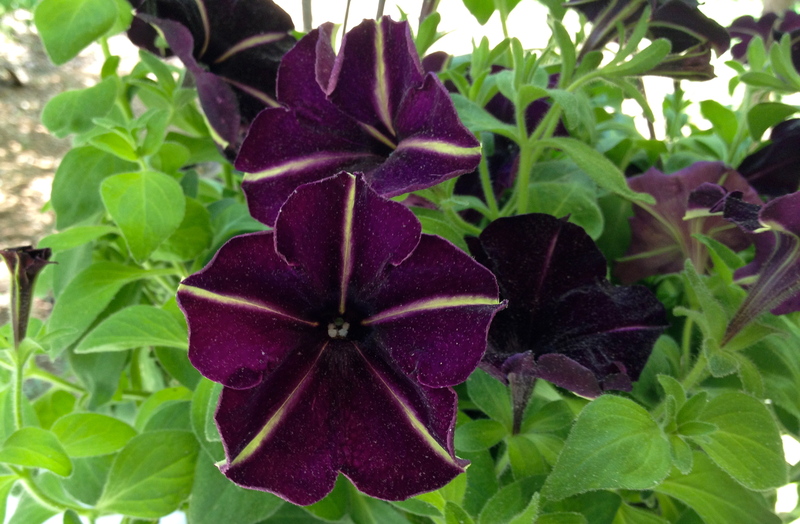 Learn more about petunia care here.